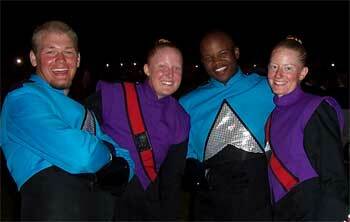 Spirit sopranos Andrew Arther, far left, and Brandon Rucker stop to chat with two Magic of Orlando members. This picture was taken while corps were waiting to be lined up for retreat at Papa John's Caardinal Stadium in Louisville, Ky., on June 21. Photo by Pam Arther, mother of Andrew, and Spirit volunteer. E-mail your Forzato submissions -- and we will get to them all, in time -- to dave@dci.org along with where and when the photo was taken. Send some biographical information about yourself as well. We'll give you full credit. Also, let us know if you want your e-mail address included, to get feedback from other drum corps fans.